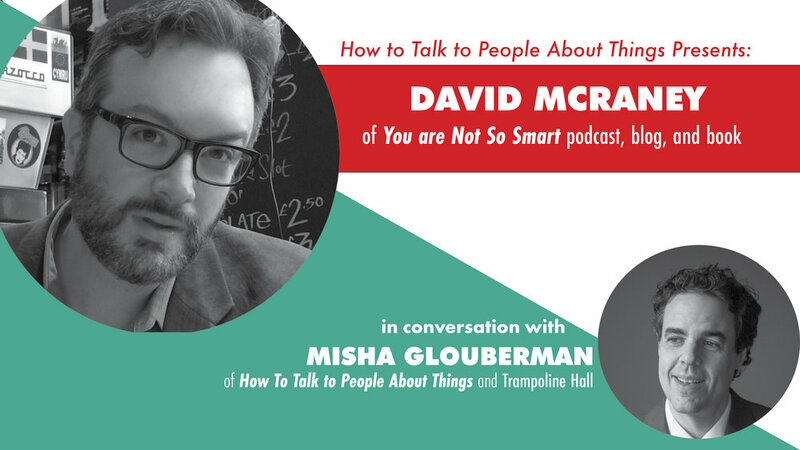 I’ve been a longtime fan of David McRaney’s books, blog, and podcast (You Are Not So Smart). David is a great writer, storyteller, and explainer of complicated ideas, with an ongoing fascination with the foibles and frailties of human cognition. David’s upcoming book sounds to me like his most exciting project so far. It’s about how people change their minds, and also about how they don’t, even in the face of mountains of evidence. He talks to anti-vaxxers, to people who joined (and left) cults, to former members of the Westboro Baptist Church, and to a group of LGBTQ activists who have developed strategies to shift opinions through conversation and listening. As in all his work, he also talks to a huge range of researchers and experts, and synthesizes all their work with insight, clarity, and wit. I’m tremendously excited to be talking with David about all this, at Toronto's Gladstone Hotel, on Sunday, April 22nd. This event is the launch of the How to Talk to People About Things Conversation series, an irregular series of live events where I’ll be talking with writers and other people whose ideas connect with my own interests in helping people better communicate, collaborate, and understand each others’ points of view.